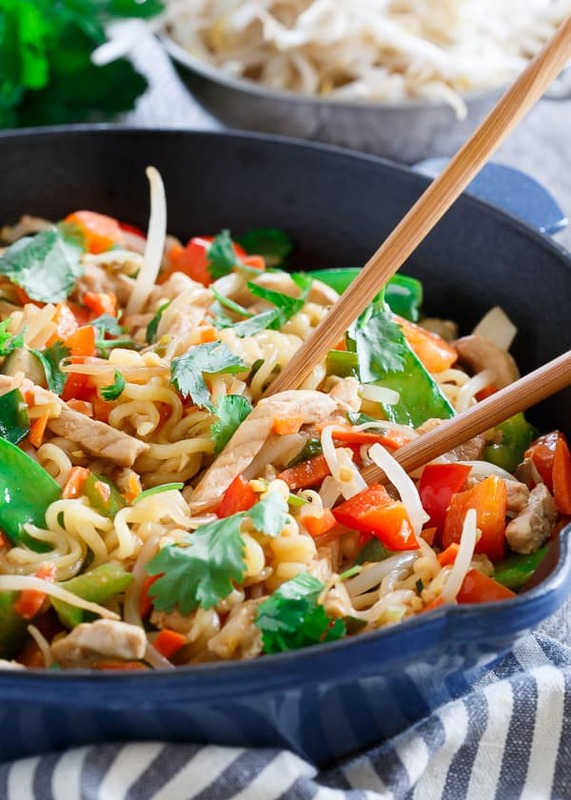 This 20 minute pork ramen stir fry is sweet, spicy and filled with vegetables for an easy, healthy weeknight dinner. The first time I ever heard about ramen was freshman year of college. Come 2am, many underage drinks and a few frat parties under our belts, everyone was all “RAMEN NOODLES!” like they were the best thing on earth. The smell of those horrible styrofoam microwave containers heating up literally made (and still makes) me want to gag. I was much more of an Easy Mac kinda girl personally. It’s sad to admit this, but years went by and I never knew ramen was actually like a “real” food and not just some horrible microwave convenience item targeted at drunk college kids without kitchens. My eyes were finally opened to the amazingness of REAL ramen noodle bowls in recent years and now any time I find a place (usually a hole in the wall joint) that serves them, you can pretty much guarantee I’m ordering it. After making this homemade spicy pumpkin ramen, I’ve had about 6 packs of the noodles leftover since and finally decided to put them to good use in this 20 minute sweet and spicy pork ramen stir fry. 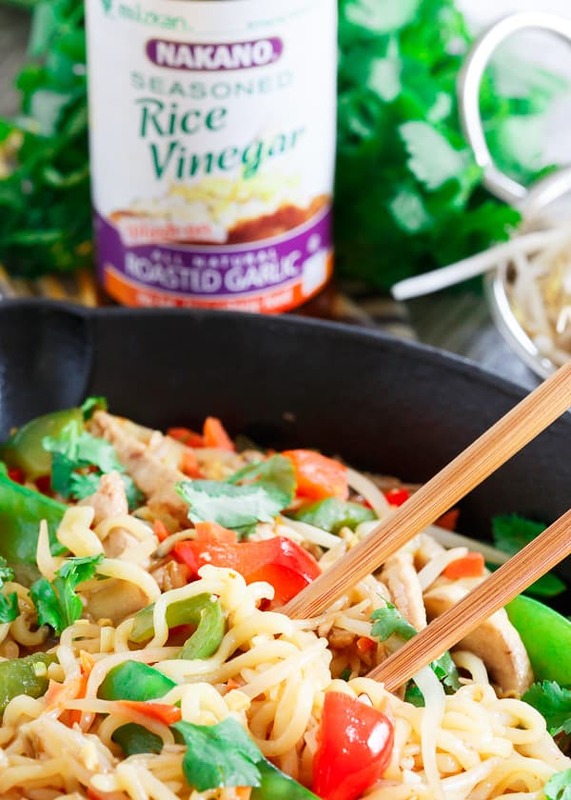 It’s basically a noodle bowl meets vegetable stir fry with some pork thrown in, a clash of everything Asian you love and an addictive sauce that coats it all. Speaking of addictive sauces, don’t miss these Chinese boneless spare ribs – they taste just like takeout and are another great pork option! Ginger and garlic are the main flavors in the sauce thanks to Nakano roasted garlic seasoned rice vinegar, lots of fresh minced ginger and garlic cloves. 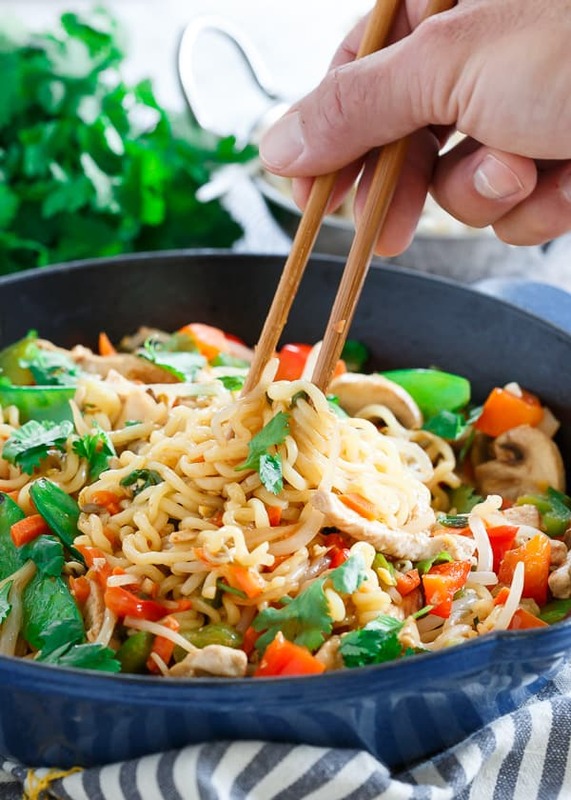 Add some honey and sriracha and it’s a deliciously sweet and spicy, finger licking coating to one heck of a ramen stir fry. 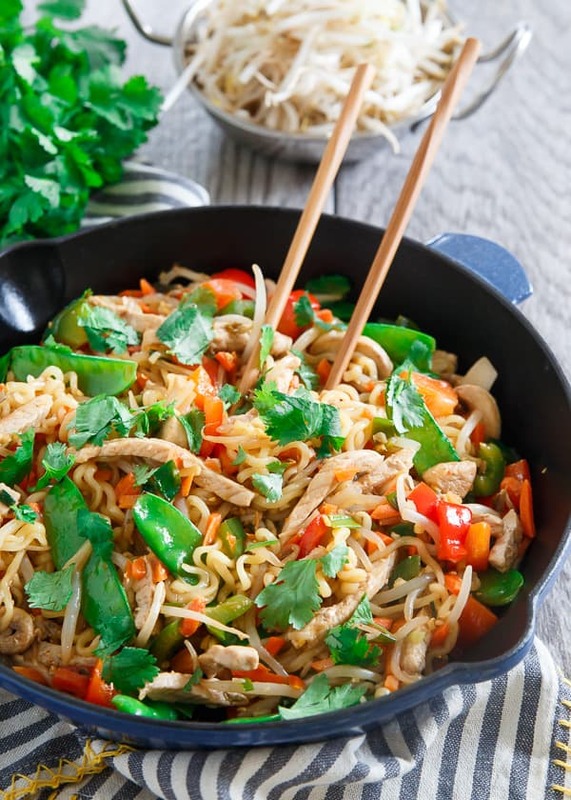 Love this 20 minute sweet and spicy pork ramen stir fry recipe? Want more 20 minute meal ideas? This jalapeno mango chicken skillet or this spicy beef and red pepper rice bowl are perfect quick and easy weeknight meals too! Combine all the ingredients for the sauce in a small bowl and whisk together, set aside. Bring a large pot of water to a boil. Add ramen and cook according to package directions, drain and set aside. Add the avocado oil to a large skillet over medium heat. Once hot, add the garlic and ginger and cook for 1 minute until fragrant. Add the pork to the skillet and cook until browned, about 3 minutes. Add the vegetables, toss to combine with the pork and oil mixture and cook for 3-4 minutes until just softened. Add the ramen to the skillet, pour the sauce on top and toss everything together using tongs until well combined and coated in the sauce. If you can't find pre-packaged prepared stir fry vegetables, use a mix of red bell peppers, mushrooms, carrots, sprouts and snow peas and/or anything else you want to throw in. It's versatile! Like you, I can’t take ramen cup noodle. I just can’t find it good, but this ramen stir-fry sounds so delicious. I love how you add more ingredients to it and 20 minutes? Sold! I’m embarrassed to say that I have yet to have real ramen. I haven’t had the styrofoam crap since I was a kid and even then I was more of a mac and cheese girl. I totally need to give the real stuff a try and your easy sweet and spicy pork version looks like a great one to start with! I could never touch those ramen noodles in college either. But then we went to Japan and figure out what real ramen is. SO good, and so not even close to those cups. 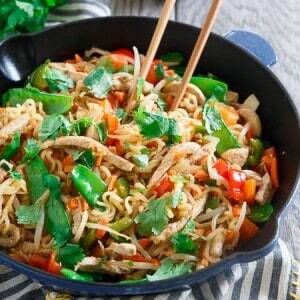 I love this idea for a stir fry, such a great quick and easy weeknight meal! I never understood the appeal of the ramen noodles in a cup. No flavor and awful texture. These noodles, on the other hand, I’m pretty sure I could eat every week. I love the sweet and spicy flavors! Ramen Cup of Noodle makes me sick to my stomach… I love this REAL version of ramen noodles though! I absolutely agree…real ramen is amazing and nothing like those awful cups! This is one stunning dinner…and 20 minutes? Perfect! I love Nakano’s vinegars, but I’ve never tried this garlic one…I need to look for that! Sounds good. Thank you. Have a great week. Gina, are you ready for this one? Are you sitting down? Okay, I’ve never had ramen noodles before. I know right. I’m probably the only person on earth who hasn’t tried them. Now that I know ramen can be AMAZING I need to try this recipe. I love pork, I love noodles and I love sweet & spicy recipes. This has to happen. I can’t wait to dive into the world of ramen. Great photos! This looks delicious and everything I would like! I’m curious what brand of “real” ramen noodles do you buy? I don’t think I’ve ever seen them except in those horrible cups or packages. Thanks! Will have to look when I get home (in Mexico on vacation right now!) It’s some Asian brand from a local/Asian grocery store I won’t be able to pronounce or write, I know that much! absolutely agree about those cups! I love how quick this can be made- it looks and sounds amazing! Your blog is very beautiful ! Thanks. How many weight watcher points? Sorry, I have no idea. I don’t do weight watchers and don’t calculate nutritional information for the recipes on here. Pingback: 22 Healthy Dinners That Take 30 Minutes or Less!